Moisture and heat cause bubbles and blisters on a newly painted wall. If the blemish appeared after the paint dried, it's probably due to moisture in the wall or, more commonly, patch material that hadn't dried completely. If the blemish appeared while the paint was still wet, it's probably due to excessive heat. Before fixing the paint, address the initial problem. Allow patches to dry for several hours or overnight before painting over them and avoid painting on very hot days if possible. Run an air conditioner or fan to lower the temperature if you're painting on a hot day. Avoid applying paint in direct sunlight. Sand the paint to remove the bubble and smooth the surrounding paint. Make sure the wall underneath is completely dry. Wait 24 hours if it's not. Wipe away any dust with a lint-free cloth. Apply a thin coat of primer to the wall, extending it slightly beyond the bare area to cover a 1-inch portion of the painted wall. Let it cure for 24 hours if possible. 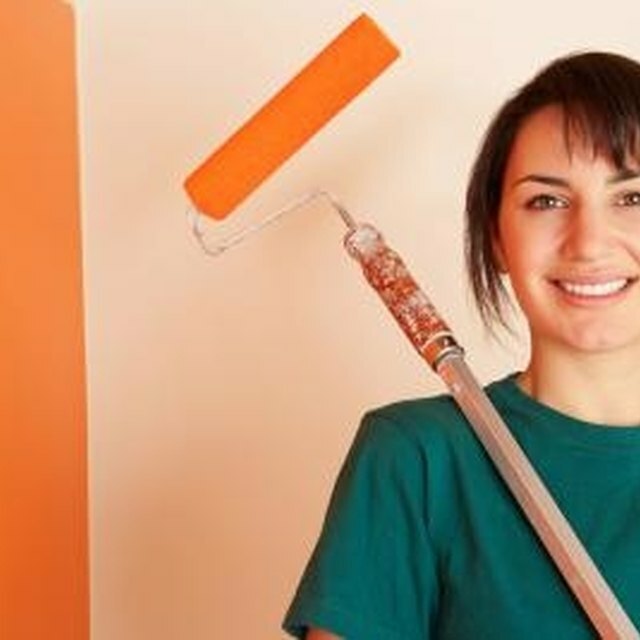 Apply new paint to the area lightly with a small brush or sponge brush. Use a feathering motion to blend it with the surrounding area. Recently plastered walls may still have moisture in them. Wait for them to cure before painting.